We just wanted to pass along our thanks for a wonderful trip. We both agree that the bike tour was the highlight of our trip, and one of the best vacations we have been on. It was so beautiful and fun and indulgent. It couldn’t have gone smoother and we had a great time with Marco. Thank you for making or honeymoon so special. We would love to see the pictures that he took of us during our trip if you could send them to us. 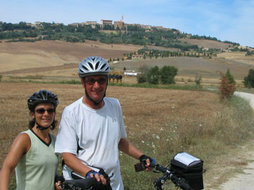 Marco and Jodie: Thanks for the wonderful experience of Val d’Orcia Dream. Now back in my office I can tell that it was really a dream. I will recommend the tour to other people and maybe we will see you again. Jorge Berrios. Marco, thank you again for the great time you gave us. Jorge's dream was completely fulfilled and you had a lot to do with that. Seeing the beautiful scenery and riding hard when I needed to was really good for me. The sound of the sheep walking with the bells around their collars is something I will never forget. We enclosed a few photos of us on our bikes, and a couple of the two of you. Hope it is cooler in Tuscany than here in Chicago on the 4th of July (100 degrees F today, supposed to be hotter tomorrow!) We decided not to bike in the heat here. Hope all is well. 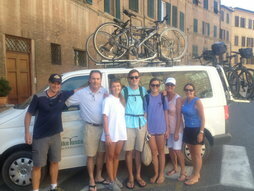 We are enjoying looking at all the great pictures from Italy and re-living our wonderful trip with the two of you. ... for making our honeymoon an unforgettable great start to our marriage! Babbie and I couldn't have had a better time thanks to you and the tour. The fact that we were able to get out into the country side and small towns gave us the true feeling of Tuscany. We look forward to our next tour! Also, as I mentioned, if you are ever in the States and are near Aspen, Kansas City or Birmingham then let us know. We would love to host you! I just want to reiterate what Gail Hoerr already said to you, but our bike trip with you last week was most certainly the highlight of the trip for me! I saw Steve Runkle the other day (he rode with you last Tuesday), and he, too, said the bike trip was the highlight of his trip. You run a wonderful business, and I appreciate your accommodating us with our different opinions. It was especially nice to be able to add ten miles to our ride. Thanks again for a great day! I have already begun spreading your name to others. 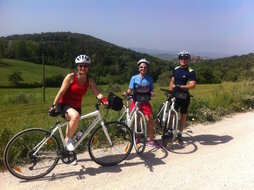 Mitch & Amy Merin, New York, U.S.A.
We had a spectacular time with you biking in Tuscany. 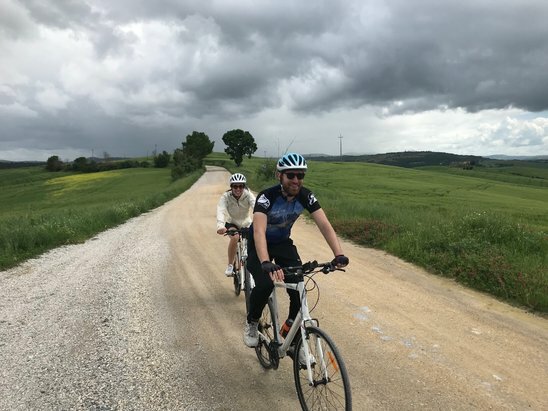 We had a wonderful honeymoon and saw many beautiful sights in Venice, Tuscany and the Amalfi Coast, but the best part of the trip was biking with you. We saw so much by riding rather than driving through the towns and country. We'll be back and we'll see more of Tuscany with your company.